The Peninsula's rooftop restaurant is the place to be on the weekends. It has its own menu separate from The Belvedere downstairs, a full bar of countless specialty cocktails, and a beautiful poolside scene. Lounge on sleek custom-made furniture while a vertical garden wall separates the bar/restaurant from the hotel-guests-only pool deck. And while going barefoot isn't encouraged, the limestone flooring remains heated for chilly nights. The Peninsula has a three-course barbecue every weekend for $55. Begin with three varieties of salads, watch your entree prepare on the outdoor grill, and enjoy a fabulous dessert. Try the speckled jalapeno margarita. It is served on the rocks and has a definite kick. The pomegranate mojito has a clean taste of mint without any of the residue ( I hate the pulp). Parking meters are all over the neighborhood, but if you prefer valet, it's $8 for first two hours and $2 for every 30 minutes afterward with validation. The weekend bbq is served from 4pm to 9pm. 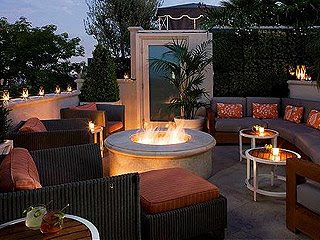 The Peninsula is located at 9882 S Santa Monica Blvd in Beverly Hills. Call (310) 551-2888 or click the title link for more info. Hmmm, that sounds tasty. A bit pricey tho.